How to Secure Your Tiny House Against Break-Ins and Theft. A thief would have to be pretty determined to steal a whole house. A tiny house on wheels is a highly visible item and most are custom-built, making it an easily recognizable theft. It’s not the type of thing a thief can slip away with in the night and sell on the internet, never to be seen again. There are only so many places on the internet to sell one, all of which can be monitored to see when the house comes up for sale. 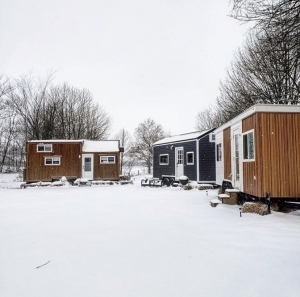 Additionally, to transport a tiny house, one can take it on certain roads, but it has to have a license plate, and any tiny house owner can attest that tiny houses on the road generate a lot of buzz. However, two recent thefts of tiny houses have popped up in the news, reminding us that while rare, it can happen. On that note, it’s important to find a way to secure one’s tiny house and prevent or at least deter thieves from breaking in or stealing it. The best course of action to ensure your house’s security is having multiple theft deterrents. The idea of theft deterrence is realizing you can’t do everything possible to ensure your house will never get broken into or stolen altogether, but there are many small things you can do to discourage criminal activity. Many thefts are crimes of opportunity: if you make it a difficult and time-consuming for a thief to quietly drive away with your house in tow, they are more likely to pass your tiny house up. Just a note: we’ve included links to certain products in this article. We aren’t being compensated for posting any of these products and we don’t necessarily recommend or guarantee these exact products: the links are here so you can get a feel for what they are and how they work. A hitch lock is an easy, quick theft detterent. It can be cut off, but not without spending some time and creating some noise. This will at least slow down a potential house thief, and some have the added benefit of preventing runaway trailers. 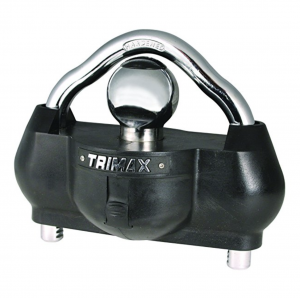 There are numerous types of trailer hitch locks, ranging in price from about $17-$45. Here’s a list of reviewed trailer hitch locks from thetoppro.com. 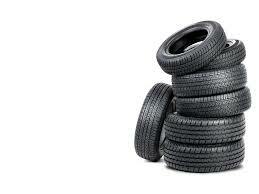 These work in many different ways, but the one pictured here covers the wheel, rendering it immobile. You can also purchase locks for the lug nuts themselves. Here’s a list of wheel locks from etrailer.com: they range in price from under $10 to $180. 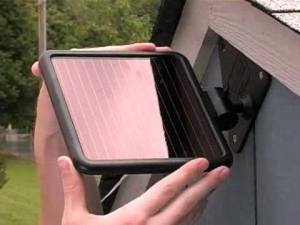 God forbid someone actually gets away with your tiny house, it would be easy to track if you have one of these in or on your tiny house. Hundreds of discreet GPS trackers are on the internet, and many are inexpensive enough to make the purchase worth the peace of mind you’d get from having one. 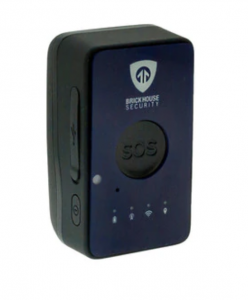 The tracker pictured here, from Brickhouse Security (here are their best GPS trackers), is less than 2″ x 3″, so you can place it inconspicuously so a thief doesn’t know it’s there. You can track its location on your phone or computer. As the economy forces package thieves to become bolder and bolder, the market for home security has exploded, and security cameras are getting cheaper every year. Even if your security camera doesn’t prevent the most determined thief, it is certainly a theft deterrent. Some security cameras use motion detection to start recording a ten-second video; others record all the time. Security cameras that store the images and/or video inside them are only helpful after you recover the camera itself. 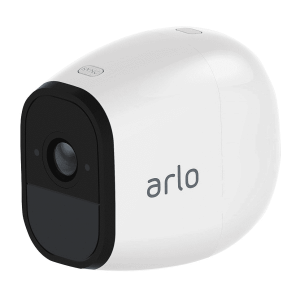 A smarter choice is either a wifi-connected home security camera like Arlo or Nest, or a trail cam, which operates on cell data (you’ll have to pay monthly). 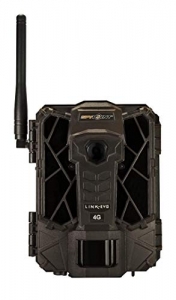 Both a wifi-connected cam (here are PC Mag’s top picks for 2019) or a trail cam (here are Trail Cameras’ Reviews for 2018) allow you to see the images in near-real-time on your phone or computer. If a security camera isn’t enough, you can have a whole integrated security system in your tiny house, as long as your house gets constant power. Smart home security systems like Honeywell’s allows you to choose a la carte what features you’ll use, such as notifications when windows or doors are opened, motion light activation, facial recognition of those entering your house, and voice control with Amazon Alexa. (Full disclosure– Honeywell’s not paying us to post this, but we did build a tiny house for them integrating their smart home tech, so we’re familiar with their technology and we like their brand). These lights are great for when you’re not at home but want to give the impression that someone is there. 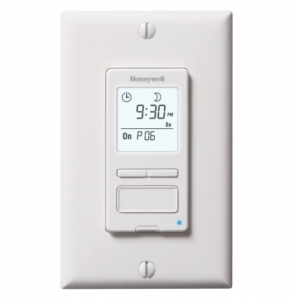 The simplest and cheapest option is a light timer, which can either be plugged into a wall socket (this one’s by Dewenwills, pictured at left) or integrated into the light switch plate (this one’s by Honeywell, pictured at right). 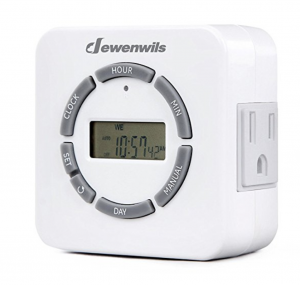 It turns a lamp or electric outlet on and off at a specific time or times every day. The mechanical ones make a clicking sound that will drive you nuts in a small space, so we recommend an electronic light timer. Most people have been familiar with motion sensor lights for decades. Not only can they be a theft deterrent by attracting attention to the house when there’s movement, they can also increase the security of the tiny house dweller when coming home and fumbling for keys in the dark. Here’s The Spruce’s list of best motion sensor lights for different outdoor areas. Some of these contain the sensor within the bulb, so the bulb can be screwed directly into any light socket, which means you won’t have to do any wiring to make them work. Some of the lights on this list run on their own solar power which is nice for when your tiny house isn’t connected to a power system. Like timed lights, remote controlled lights help create the illusion that someone’s home, but they’re a bit “smarter” in terms of going on either when they sense motion or when you decide to activate them from afar via your electronic device. Remote-controlled smart lights, for when you’re far away to your wifi-connected tiny house, allow you to turn on a light in your home via an app on your phone. Here are a couple ways to integrate smart lights from Make Use Of, whether your house hasn’t been built yet and you can install these during the building process, or you’d like to install plug-and-play smart lights in your exisiting tiny house. You can also get remote control of the lights in your tiny house by incorporating them into your existing smart home security system. This one’s pretty simple: although not all tiny house owners are parked near neighbors, those who are and have a friendly rapport with them can ask their neighbors to keep an eye on their tiny house. Having possible witnesses close by is a major deterrent to break-ins and thefts. 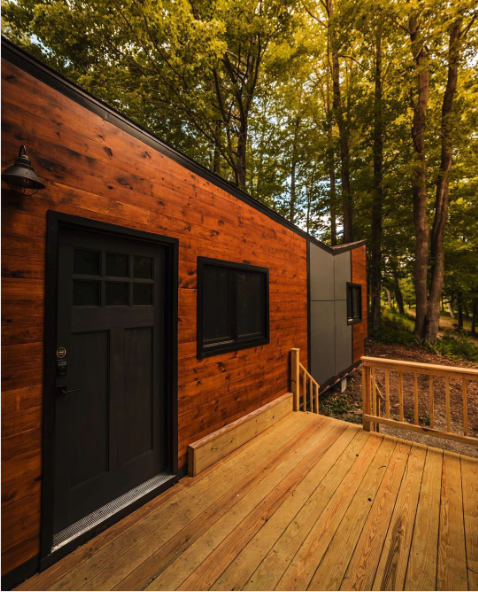 When choosing a location for your tiny house, from a theft deterrent standpoint, consider how easy it is for someone to get away with your tiny house. Anyone who’s ever towed a tiny can attest that tiny houses attract a lot of attention on the road. People peer out of their windows, take photos, post them on the internet. Whether you want to attract attention or not, it’s like being in a single-float parade. Likewise, if your tiny house is easily recognizable, it’s more easily recovered. 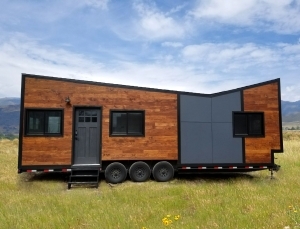 An unusual looking tiny house can’t go as far and long without being reported. For those who do not travel with their tiny house, tie-downs aren’t just a good idea for theft deterrence. They’re also a great idea to keep the house from rocking or even lifting during a hurricane. 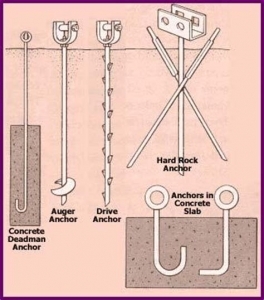 Although one can remove the house from the anchors (with varying degrees of difficulty depending on which type of anchor you’re using), this takes time and is another way to deter theft. Additionally, building a porch onto the front of your tiny house not only expands your livable space in nice weather and creates a more welcoming entrance, it makes it more difficult for a thief to quickly steal your tiny house. 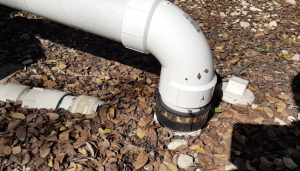 Like anchoring with tie-down straps, it’s not impossible to remove a septic or sewer tie-in, but it takes longer, requires tools and knowledge which means it takes longer to steal someone’s house. 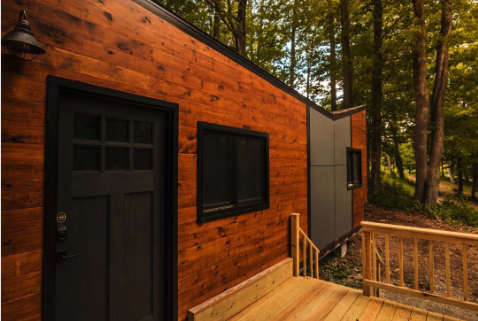 Of course, not all tiny houses stay in one location– they are on wheels, after all– but for those that do, this is a great option. When the tires are removed, a thief can’t just hook up a tiny house to their truck and roll away with it. 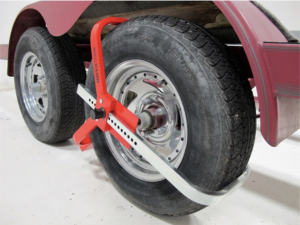 It takes time and tools to attach four or six tires to the wheels of a trailer: time that exposes a thief to witnesses. You can’t say for certain that your tiny house will never be broken into or stolen. However, the chances of that are very slim; you can make them slimmer by taking some of these simple precautions.